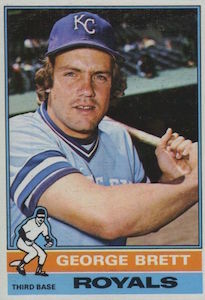 A familiar name for those that followed the game in the 1980s, George Brett is the only player in Major League history to win a batting title in three different decades. While Brett excelled on the field for the Royals for more than two decades, collectors have been enjoying his cards for the better part of five decades now. The top ten list below showcases the best cards from Brett's playing days and more modern issues which have connected the Royals great to a new generation of collectors. Shop for George Brett Cards on eBay. 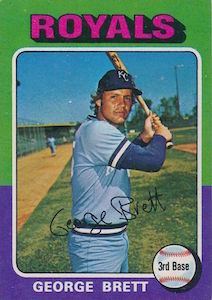 George Brett is best remembered by baseball fans as being one of the top pure hitters of the 1970s, 80s, and early 90s. The first-ballot Hall of Famer ended his career with more than 3,000 hits and a lifetime batting average north of .300. Along the way to compiling lofty numbers, the gritty third baseman won the 1980 American League MVP Award, 3 Silver Sluggers, and was named to 13 consecutive All-Star teams. George Brett also helped the Royals claim their lone World Series title in 1985 by defeating the St. Louis Cardinals. Starting in 1974, George Brett spent his entire 21-year career with the Royals. However, collectors had to wait a year for his first cards. While a large portion of his career coincided with the "junk wax" era, Brett's cardboard has remained highly popular with collectors and made him an appealing subject for modern products. 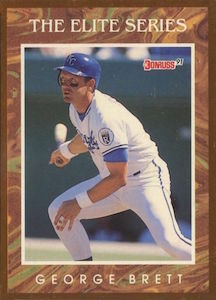 This list of the top George Brett cards spans several decades and includes key rookie cards, inserts, and autographs of the greatest Royals player ever. Value is important, but the overall collecting relevance was taken into account to deliver a mix that works for all collecting budgets. Stadium Club has long been a popular product for its great photography and the first Stadium Club sets were released towards the latter years of Brett's career. However, the 2015 set offers collectors one of the most popular options and that is due to the iconic image shown. The picture on the card originally appeared in a 1976 copy of National Geographic Magazine, and interestingly enough, was later the inspiration for the song "Royals" by Lorde. The final Topps base set card from George Brett's career features a great photograph of the Hall of Fame third baseman with Kauffman Stadium's iconic scoreboard and water fountains in the background. While it is commonplace to find cards of George Brett batting at the stadium, there have been very few cards over the years that have captured the distinct features in the Royals home park. 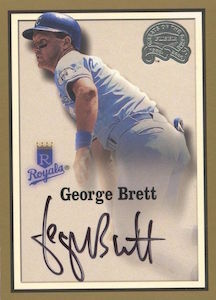 This final George Brett card has been a favorite of card collectors for the past two decades. There is a huge contrast between the designs of the 1975 and 1976 Topps sets. While the unique design of the 1975 Topps set probably increases some of the interest in Brett's rookie cards, his second-year card has still been very popular with collectors, especially those interested in graded cards. The population of highly-graded 1976 cards is sparse and is often reflected in the high prices that collectors are willing to pay. 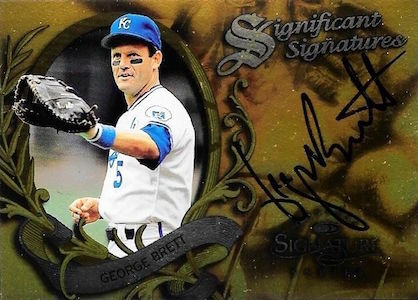 The 1997 Donruss Significant Signatures George Brett was the first chance for collectors to own a certified autograph card for the Hall of Famer. While the print run of 2,000 copies now seems to be an enormous amount of cards, this autograph is still a tough find and remains in high demand. Although Brett has signed plenty of cards over the years, his early autographs have held their value well, including this gem from the late 90s. Topps dominated the card market in the mid 1970s, but other card companies still tried to produce card sets. The SSPC set was produced by TCMA, which made their cards available via mail order. Despite its 1975 copyright, most collectors consider this set a 1976 product. 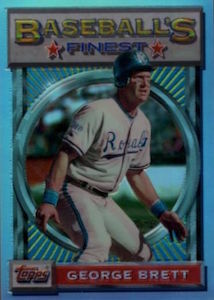 In the case of George Brett, many collectors still view the card as one of his rookie issues. He also has a second card in this set that features him alongside teammate Al Cowens. The 1991 Donruss Elite set was one of the great early inserts in the hobby. While the cards are serial numbered to 10,000 copies, they generally averaged less than one per case. The checklist only featured eight Elite Series cards and they are still highly sought-after by collectors. All of these factors make George Brett's Donruss Elite Series card one of his mostly popular cards. 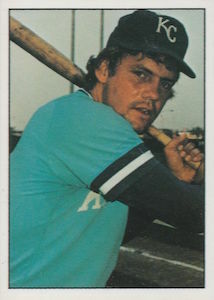 Although George Brett did not appear in the original Greats of the Game set, he had been inducted in the Hall of Fame by the time that Fleer rolled out the sophomore version of this card set. While this card was not his first certified autograph, the card is a short print, making it one of the tougher autographs in the set. The gold borders on these cards are also susceptible to chipping, which makes this card condition sensitive as well. The 1993 Finest set was Topps' first venture into the premium card market and twenty years later these cards are still the gold standard. The most popular cards in this product were the parallel set of refractors. The exact odds of pulling a refractor were not ever officially released by Topps, but many collectors have found that the cards average around one per box. The refractor version of George Brett's Finest card have been extremely popular with collectors in both raw and graded forms. Topps has released several mini in recent years, but the card company first experimented with the idea in 1975 when they printed a parallel mini version of the normal base set. While many collectors flock to the regular base set version of George Brett's rookie card, the Topps Mini is also a must-own for die-hard George Brett fans. 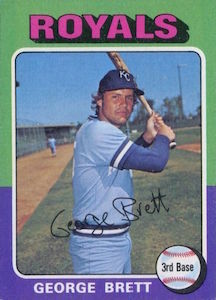 The George Brett rookie card in the 1975 Topps set has long been regarded as one of the best baseball cards of the 1970s. The set design deviated from the norm and featured a two-toned frame around the player image. 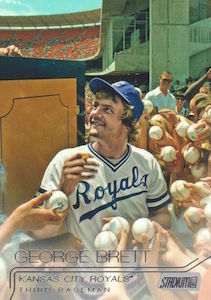 Several of the rookie cards in the 1975 Topps set featured multiple players, however the George Brett card is one of the few single-player rookie cards in the set. This certainly adds to the appeal for collectors. In addition to the base and mini cards, there is also an OPC version. 1985 The Kansas City Star Newspaper George Brett Card - RARE!!! Glad to see 1994T #180 make the cut. 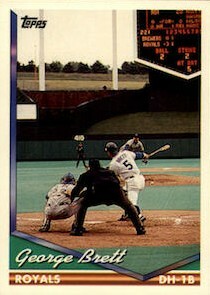 I like how the 1994 Topps Home Plate Design echoes the Royals scoreboard. I love the outfield of Kaufman Stadium and could not imagine making a George Brett list without that 94 Topps card. I know that it has been remodeled in recent years, and that area looks a little different now, but I thought it was really cool that Topps squeezed the scoreboard into his final base set card. It would have been cool to see a little fountain action in there too.